ETR Industria Mecanica Aerospacial Ltda. ETR, was founded in 1991 by mechanical engineers with a large experience in the field of military products. The company's initial aim was to produce and supply airborne weapons to the Brazilian defence ministry and to governments of Latin-American countries. This aim has been successfully reached. Meanwhile ETR has extended its sales activities beyond Latin-American borders, including Asia and Africa. The company is in a position to supply top quality products at internationally competitive prices. 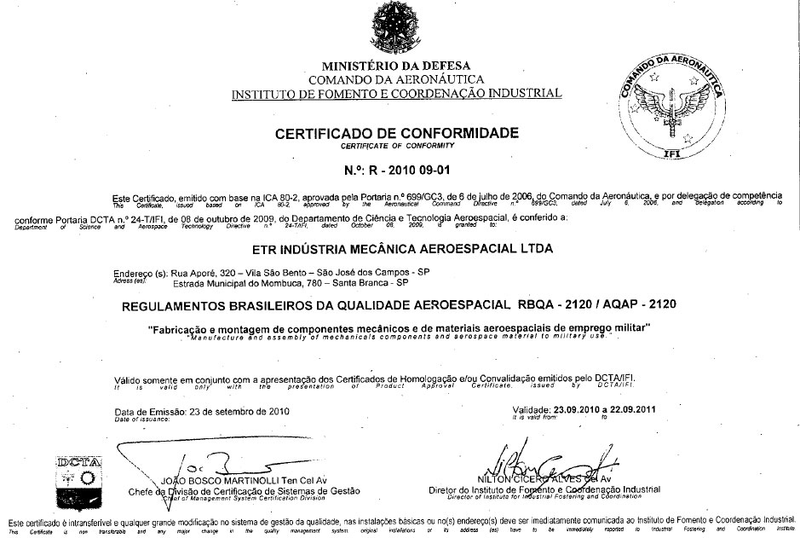 ETR Certificates of Quality Assurance: ISO 9001:2000, by SGS (Societe Generale de Surveillance), Brazil RBQA-2120, in stage of updating, by CTA (Aerospace Technical Center of Brazil). 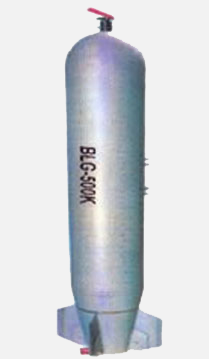 The Blg od Cbs (Cluster Bomb System) is a multiple affect, non guided, free fall container filled with variable number of PM-1 (bomblet or submunition) for each type BLG-500k, BLG-250k and BLG-60k. They are designed for tactical use against dispersed ground targets in big areas. This highly versatile system has been proved in combat situations, and may effectively be used against a wide range of hard and soft targets having anti amour, antipersonnel and incendiary effects. The trajectory of the bomb is ensured by the stabilizer that provides stability and direction to impact the target area. The main body opening time is controlled by the programmable aligned electronic fuze EEA-II, which provides a wide range of possibilities. The dispersion of the bomblets is ensured by the spinning of the container after being released from the aircraft. The PM-1 is a small bomb of a slender shape with a plastic extension and a copper cone specially designed to produce the hollow charge affect providing the anti amour capacity (Monroe effect). The pre-fragmented body provides the anti personnel affect. Special inserts inside the charge provide the incendiary effect. A plastic stabilizer and a non aligned fuze stabilized and armed the PM-1 during the fall. Penetration (mild steel amour) Lethal area: 452. Length With Fuze: 2.060 mm. Metalnor manufactures a complete series of General Purpose aircraft bombs ranging from 500 lbs. to 2000 lbs. The Low drag, free fall, General Purpose bomb made up of steel is a standard aircraft weapon and in general use all over the world. These bombs can be triggered by impact or a proximity fuses, mounted on the nose or in the tail and their devastating effect upon impact is caused by the shock wave produced and the fragmentation of the bomb steel case and debris thrown out by the explosion. The long, narrow and aerodynamic shape of Metalnor's General Purpose Bombs allow them to be carried under wings or fuselage or high speed aircrafts with minimum performance degradation. Between 35% and 40% of the bomb total weight consists of explosive which can be tritonal or Hexolite. These explosives are characterized by their stability and insensitivity to shock or heat ensuring outstanding safety for storage, transport, handling and loading on aircraft. Metalnor's bombs can be fitted with the standard NATO 14 in., Warsaw Pact 250 mm. All Metalnor's General Purpose Bombs can be fitted with high drag fin assemblies, Metalnor's developed Pallon Tail Parachute. The safety mechanism is released the moment the bomb is drop and four scoops are opened on the nylon dome, producing an air current which inflates the pallon. The speed of the bomb decreases quickly when the pallon is inflated. The APF Bomb series have been developed for use against soft skinned targets by means of shrapnel fragments dispersed over wide areas. Against the short lethal fragment range of the General Purpose Bomb, an APF is 3 to 4 times more effective a giving a high density of similar sized shrapnel balls over larger zones. APF Bombs are composed of a high resistant fiberglass casing in which are inserted steel pellets of an average diameter of 10,5 mm a fixed fin steel sheet stabilizer, a tritonal explosive charge, and a impact or a proximity fuze. In shape, Dimensions, weight and aerodynamic properties APF Bomb are similar to the GP MK Series bombs and can be fitted with low or high drag stabilizers for low level attacks. This bomb may be released by type of combat aircraft with NATO (14in), Warsaw Pact (250 mm.) suspension system and their loading and arming procedures are the same as those of the standard GP MK Bombs, needing no special training. Bomb affect is through blast and shrapnel dispersal. Fragments are made of cast steel providing a hardness of 57 to 60Rc. with a mass of 5gr. This type of fragments gives the best penetration capability. Depending on fuse timing, altitude, speed and release angle, an APF 84 can saturate an area of 80.000 sq.meters. Multiple launcher LM- 70/7 M1 is designed to be used with Rockets FFAR 2.75 and SBAT-70 mm, a weapon to be employed as AIR-GROUND and is compatible with aircraft performance, tactical operations and training use. Is a reusable element to the launch of 7 (seven) rockets, and similar to the LAU-68 A/B Launcher. Its operation is very simple and at low cost as well as and presenting exceptional shot speed. Presstecnica Industria e Comercio Ltda. Faparmas –Torneados de Precisao Ltda. Acotubo Industria e com Ltda.